Dr Darryl Hodgkinson has more than 30 years of experience as a plastic surgeon specialising in rhinoplasty surgery. Here he gives you the facts about nose reshaping surgery. FACT: The results of a rhinoplasty procedure can last a lifetime. Rhinoplasty is a procedure that need only be performed once in a patient’s lifetime if carried out with surgical expertise and an aesthetic understanding of what constitutes an attractive, appropriate and individualised nose for each patient. The patient must communicate with the surgeon his or her desires and be responsible for their health to maintain the result. 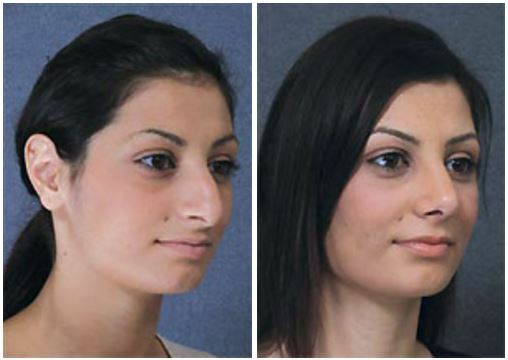 FACT: Rhinoplasty is a surgical procedure to re-shape the nose, giving it a more pleasing appearance. This may take the form of removing a bump to the dorsum, reducing the tip of the nose, augmenting the dorsum or bridge of the nose or reducing nostril flare. Most importantly, the surgeon has to have the experience and expertise not only to carry out the surgery but also to ensure the shape of the ‘new’ nose is in harmony with the patient’s other facial features, especially in profile view. FACT: A rhinoplasty should be ethnically appropriate and should be individualised to the patient’s other facial features. The ‘new’ nose should appear to be natural – not the look of a ‘nose job’ which is stereotypically reduced in size and potentially too pug, small or cute for the face, whether male or female. FACT: Problems with breathing can be corrected at the same time as a cosmetic rhinoplasty. Breathing disturbances due to distortion or swelling of the internal structures of the nose, usually from previous trauma, are correctable at the same time the cosmetic rhinoplasty or reshaping of the nose takes place, either by turbinate surgery, resection of fracture or septoplasty for a deviated septum. Rhinoplasty involves modification of the bones and cartilage of the nose, whether this be in reducing a bump or augmenting the dorsum. This process requires the skin of the nose to adapt itself to the new shape with time. FACT: Secondary rhinoplasties are not uncommon due to possible further trauma to the nose, surgically unacceptable results or patient lifestyle. A secondary rhinoplasty is a procedure to correct an inadequate, inappropriate or poorly performed primary rhinoplasty. The most prominent problems seen by the secondary surgeon are due to over-ressection of the nose, leaving the patient with a scooped out ski-jump nose, or a nose too small to suit the patient’s face. These cases are much more difficult, time-consuming and less predictable it is preferable that a patient seek out an expert in rhinoplasty for their primary surgery to avoid ending up with the ‘cookie cutter’ look of having ‘bought the wrong nose’ for their face. Patients can also compromise their rhinoplasty result through the use of recreational drugs. Rhinoplasty is probably the most artistic of all procedures performed by cosmetic surgeons. It is a very delicate procedure performed by working with the flimsy cartilage of the nose which I often liken to wet ‘Kellogg’s Cornflakes’. Two approaches to the bones and cartilages of the nose are made, either closed (without any external scars) or open with a small external scar in the columella between the top of the lip and the tip of the nose. This scar generally heals particularly well and it is practically unnoticeable, even in the early post-operative period. The ‘open’ technique gives the surgeon the advantage in difficult nasal tips of being more accurately able to work with the flimsy, distorted nasal cartilages. 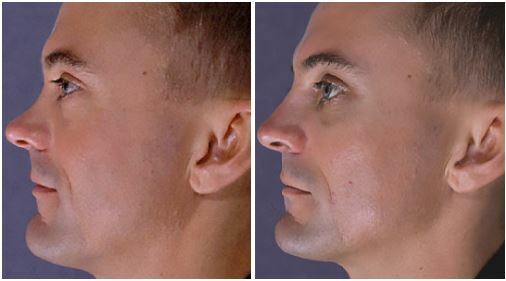 In Caucasians, the procedure often involves resection or reduction of the bony hump which makes the nose look long and too prominent, especially in the side or oblique view. In Asians, the procedure almost always aims to give the bridge more projection. Silicone Medpor and Gor-Tex have been used in Asia to give the desired dorsal projection. 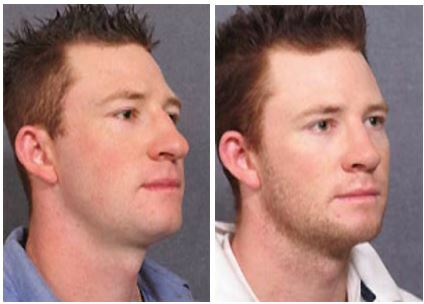 In Australia, a more Eurasian nose is requested and I prefer to use the patient’s own tissue, usually a small piece of bone from behind the elbow, to achieve the same but with a more reliable result, especially in the long term where complications such as extrusion and infection are unlikely to occur if one’s own tissue is used to augment. The nasal tip cartilages can be surgically modified, stitched and re-shaped to reduce a boxy tip to a more pyramidal shape. Usually the open rhinoplasty is used for this. 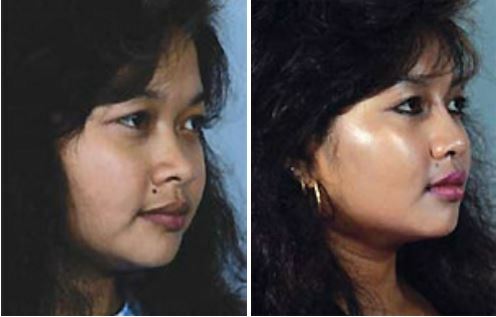 In Asians, who require more projection to the tip, cartilage grafts are stitched or stacked onto the underlying cartilages to give more projection. Having performed thousands of rhinoplasties, I still spend an inordinate amount of time with my patients prior to surgery. We have tools that allow us to better communicate with our patients such as our computer program ‘Alter Image’. Our staff specialists who have more than 15 years of experience in working with the images of cosmetic plastic surgery patients are better able to communicate the desires of the patient and reality test them against what is realistically achievable by working with them. We also encourage patients to bring in pictures of noses that they like and do not like or noses they feel would be appropriate for their face. As no two faces are alike, it is of utmost importance that I individualise the nose to achieve the most appropriate and natural-looking enhancement which does not look ‘operated on’. Healing in the nose can be somewhat unpredictable and, as in all surgery, slight asymmetries might occur. During the scar maturing phase of healing, usually about three to six months, these slight asymmetries become evident. A minor touchup procedure is needed in about five to 10 percent of primary rhinoplasty cases. In secondary rhinoplasty, where the nose requires complex grafting and underlying scarring or loss of tissue compounds to the surgical problems, the results are less predictable. We aim at improvement here but expectations need to be downplayed due to the special problems presenting in these secondary cases. Overall, the most important considerations in deciding to have a rhinoplasty are the expertise of the surgeon and the ability for you, the patient, to effectively communicate your desires and expectations to your surgeon. At the Cosmetic & Restorative Surgery Clinic in Double Bay we have the expertise, experience and understanding to help you achieve your goals. Surgeon Profile – Expertise is Everything! Dr Hodgkinson has over 30 years of experience in facial cosmetic plastic surgery. He was a preceptor in Newport Beach, California in the late 1970s after studying plastic surgery at the prestigious Mayo Clinic. Dr. Hodgkinson has continued to travel the world attending conferences, lecturing and visiting other leading surgeons internationally to ensure that his results are the best they can be. Dr Hodgkinson is an expert in aesthetic rhinoplasty and is an invited lecturer on rhinoplasty and also Asian rhinoplasty worldwide at cosmetic plastic surgical meetings . During his life of practising in the United States and Australia, Dr Hodgkinson has performed thousands of rhinoplasty surgical procedures. Patients come to Dr Hodgkinson for rhinoplastic surgery not only because of his expertise, his experience and his communication skills but also because of his ability to artistically assess all of their facial features and profile. He then determines with his patients what to expect in surgically achieving for them the result of a nose which is attractive, harmonious and appears natural for their face.